often misunderstood. Yet repentance is vital not only for your salvation but also for becoming the effective believer God wants you to be. You’ll see why as you examine the powerful preaching of John the Baptist, one of Scripture’s most intriguing characters. 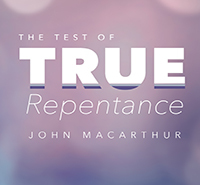 Let John MacArthur show you what it takes to pass The Test of True Repentance. 03:08 .. therefore bear fruits in keeping with repentance .. and do not begin to say to yourselves . . . we have Abraham for our father ..
03:11 .. and he would answer and say to them . . . the man who has two tunics is to share with him who has none ..
03:14 .. some soldiers were questioning him .. saying . . . and what about us .. what shall we do .. and he said to them . . .
03:16 .. John answered and said to them all . . . as for me .. I baptize you with water .. but one is coming who is mightier than I ..
03:17 .. his winnowing fork is in his hand to thoroughly clear his threshing floor .. and to gather the wheat into his barn ..